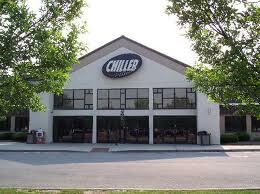 The Columbus Chill became the first minor league team ever to construct, own and operate an ice facility when it opened the Chiller Dublin in 1993. It would follow with a second dual ice facility Chiller Easton in 1997. At that time, only the NHL’s Mighty Ducks of Anaheim could make the same claim. Opening the Chiller Dublin, a $3.5 million, 77,000-square foot dual ice facility, in October 1993 was proof the Chill was committed to the expansion of hockey in the area and their long-term vision of developing into an NHL city. It was a public-private partnership in the affluent northwest Columbus suburb. Dublin, with its 16,000 residents, was a exploding with growth and political influence. (It grew to 41,751 residents by 2010) With its progressive leadership the Chill believed Dublin was the “new money” and the future power base of the city. To that point, Dublin was best known in the sports world as the home of golf’s Memorial Tournament founded by Columbus native Jack Nicklaus. Yet, opening the Chiller Dublin was fraught with perils from the past. Similar to previous hockey failures, ice rinks too had come and gone in Columbus. Past failed ice rink ventures included the Ice Chalet in Westerville, which closed in 1978; Ice Land in Columbus melted in 1982 and The Centrum, a Downtown outdoor rink at Town and High Streets, closed in 1986 to make way for the now defunct Columbus City Center shopping mall. The Chiller was vital to the organization on several fronts. First, it provided a home complete with its own practice facility, exclusive use of locker rooms, training room, offices, concessions and a gift shop. In less than two years, President & General Manager David Paitson, Legal Counsel Greg Kirstein, Marketing Director Alan Karpick had completed a deal with the city of Dublin. The Chill located and leased eight acres of land at $1 per year for 25 years, secured financing for the facility, selected a design and construction team, assembled a formal operations, programming and marketing plan and constructed and opened the facility.